Learning how to stain wood is one of those basic home improvement skills that everyone should know. Whether you are repairing old wood floors, making DIY shelves or fine furniture it’s a great skill to have to that anyone can learn to do rather easily. There are some tips you should know that can make your staining projects a lot less frustrating and deliver much better results so that’s what we’ll talk about today. By the end of this post and included video you should feel confident to stain almost anything and get professional results. Every species of wood is different and will accept stain differently. Some woods like red and white oak are excellent at accepting stain while others like yellow pine can get blotchy or uneven results even on the best day. Knowing which wood you are working with is the first key to getting a good stain job. Anytime you are planning to stain I recommend doing a test patch before you commit to the color. The color may look great on the can but seeing it on the actual wood your project is using is way more important. This is a great way to know how your wood will accept the stain as well. Use some leftover floor boards or lumber from your project for the test patch so you don’t have to sand it down again. Sanding is the key to a good stain job. Make sure all the old finish is off of your floor or furniture. Even fresh lumber can have a “mill glaze” on it which will prevent proper staining. No matter what the condition of the wood it will likely need sanding first. Start with a 60-grit sandpaper to strip everything bare and then work up to an 80-grit paper and eventually finish with a 120-grit paper. Don’t go any higher than 120-grit sandpaper because as you get into the 180, 220, 320 or higher grits you start to sand so smoothly that the wood has a harder time accepting the stain deeply. If you don’t sand enough and stop at 60 or 80-grit then you will likely see sanding marks in the wood as soon as you apply the stain. 120-grit is the nice middle ground that gets the best stain results for most woods in my opinion. Clean or tack the surface of any dust or debris before continuing. You have to make absolutely sure you have a clean piece of wood. No dust. Not even greasy finger prints or sweat otherwise it will change the way the wood takes the stain and leave marks later. For most projects other than fine woodworking (and let’s be honest if you’re reading my blog you know this is not a fine woodworking blog) I recommend “popping the grain” of the wood prior to sanding by wiping it down with water. This opens up the pores of the wood and allows it to accept the stain more deeply and evenly. Yes, you can pay good money for wood conditioners or pre-stain treatments but water works just as well! Make sure you cover every inch of the wood and let it dry thoroughly. This is a big time saver too because rather than doing multiple costs of stain you can usually get a deep rich color with just one coat. Watch the video below to see the difference it makes using water before staining on a normal pine 2×8. I’ve talked about this more in another post you can read at How To: Prep Wood For Stain. Your wood is dry and you are ready to stain. Awesome! I use Minwax oil-based wood stain for most of my projects. It’s easy to find at almost any hardware store and Minwax has a ton of colors. I’d recommend staying with oil-based stains whichever you choose because I get mixed results with water based stains. Shake the can up, put some gloves on, and apply the stain liberally with a cotton rag. Go heavy but evenly and let the wood soak it up for at least 5 mins. Then, with a clean cloth, wipe off the excess so there is no pooling and the color looks even. If you notice some uneveness or missed spots you can reapply right away. After that you are ready for you finish coat. Whether you use polyurethane, spar varnish for outdoor projects or my own special recipe you want to make sure you protect it fairly soon. At least get that first coat on the wood so it is sealed and ready for finishing later. It’s always easier to learn by watching so check out the short video below to show you everything I just talked about in action. 2 minutes later you’ll know how to stain wood like a pro! 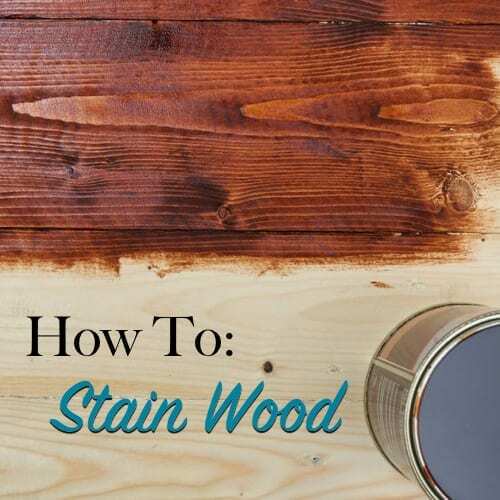 Thanks for this helpful guide on staining wood. More on the conditioning of the wood: I’ve had many projects turn out poor because I didn’t use conditioner, particularly on pine and maple. Back then, one of the main problems was: I didn’t really know how to properly apply the conditioner. But I finally took the time to do some research – articles like this one were very helpful. But how do I know if I should condition my wood before staining it? Thank you for this! I’m about to stain a table for the first time and this was very helpful. I just wanted to provide a friendly reminder to anyone trying this to dispose of the stained rags properly to avoid spontaneous combustion! Good, we are so glad to hear it! how do I best go about sanding a deck that is 20×11 before applying stain? How do I stain surfaces that are already stained? What kind of prepping do I need to do? We moved into a house that has a lot of stained interior wood work but needs a lot of touch up.